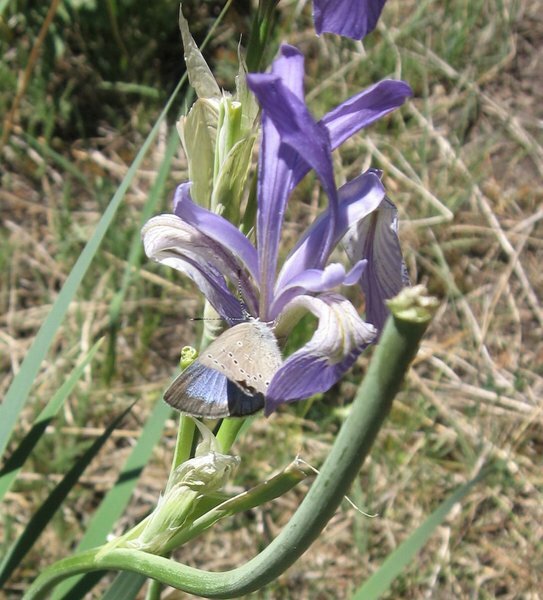 The Painted Lady and the Wild Indigo Duskywings were the first of the year here. As I was driving down Lincoln Memorial Drive (the road that goes along the lakefront in Milwaukee) at about 3:30 pm on Thursday, May 3rd, hundreds of butterflies were flying or being blown across the road from Lake Michigan. There was a storm blowing in from the east-northeast. 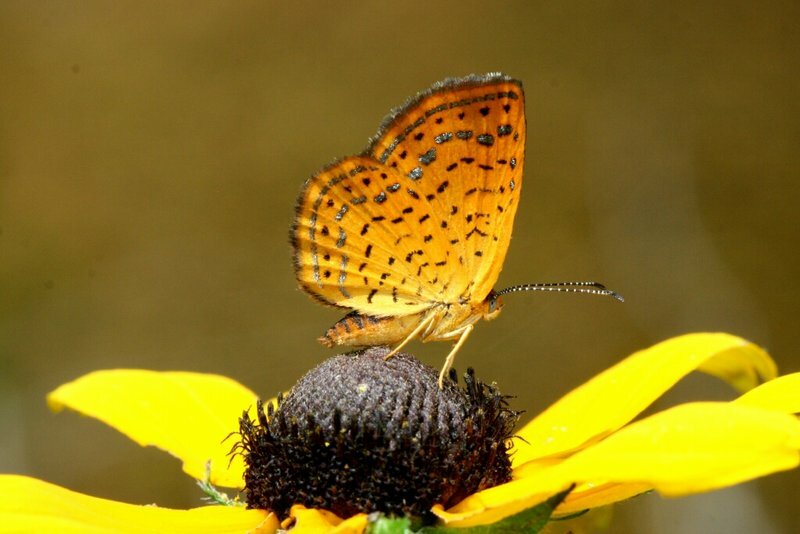 I pulled over my car to try to see what kind of butterflies they were, but was only able to see a few before the skies opened up in a downpour and thunderstorms and was I was forced to take shelter. 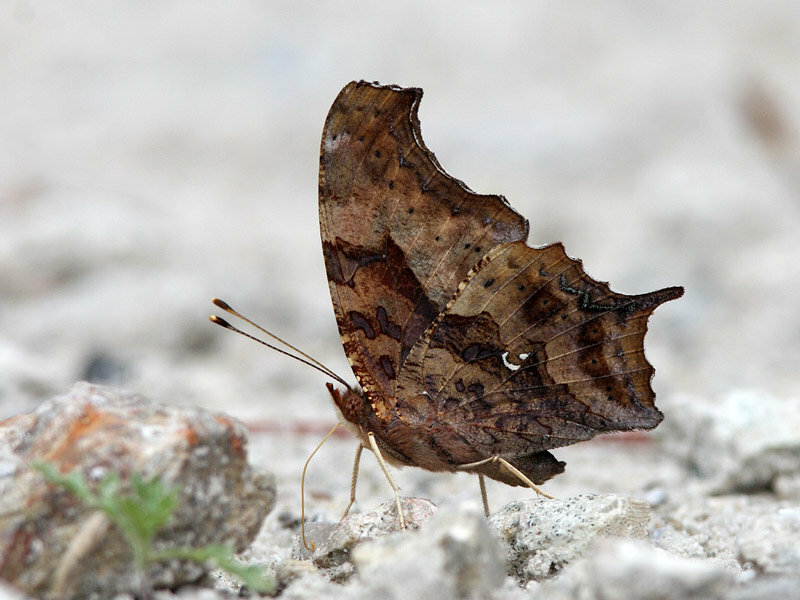 The few I saw clearly were Red Admirals, American Ladies, Monarchs, and most strangely, Mourning Cloaks. Earlier on the same morning, when I was driving down Good Hope Road heading west from Green Bay Avenue to 76th Street which is considerably inland from Lake Michigan, I also saw several groups of Mourning Cloaks flying across the road. They were flying from the south. It seemed strange to me because the area is highly urban especially on the south side of Good Hope Road; to the north there are a number of golf courses and Brown Deer Park. Since I was on a busy road and driving to an appointment, I did not stop to investigate. First locale is 4.2 miles east of Big Pine. This is the location of a Little Blue colony, which I found none flying. 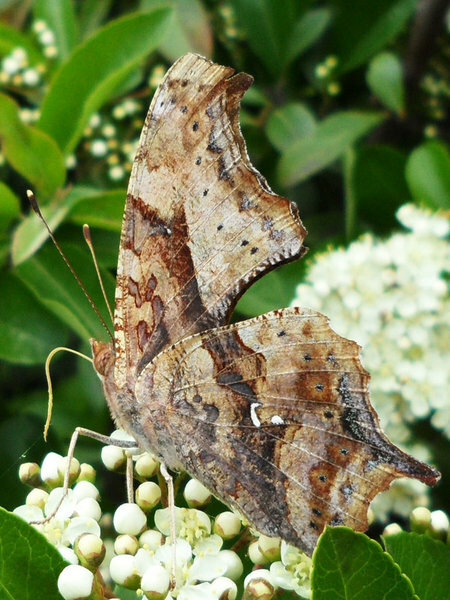 There wasn’t enough spring rain for the hostplant, ‘Punctured Bract’ to grow, so the butterfly ‘skipped’ this season. Second locale is a dirt road on the north side of Hwy 168, just before the ‘narrows’. 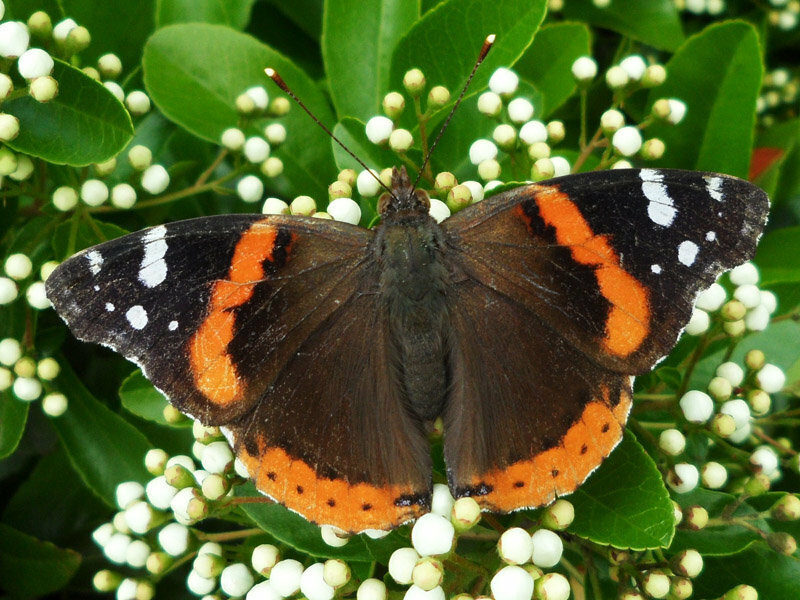 On a warm sunny Friday, dozens of Red Admirals visible in residential neighborhoods, even over main roads, many heading in a more or less northerly direction! many many red admirals streaking NE in just the short time i was paying attention, many nectaring on autumn olive by the picnic tables. Major nymphalid migration. The migration started around noon and continued until dark. By far most were admirals but included other unidentified nymphalids. 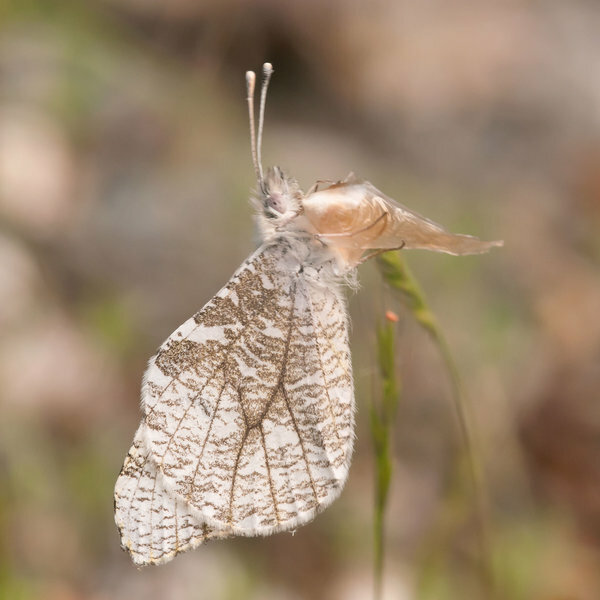 Falcate Orangetip was a fresh female and one of the Mourning Cloaks was very fresh and Red Admirals seem to be everywhere but most were moving nothward. One Giant Swallowtail was very worn. 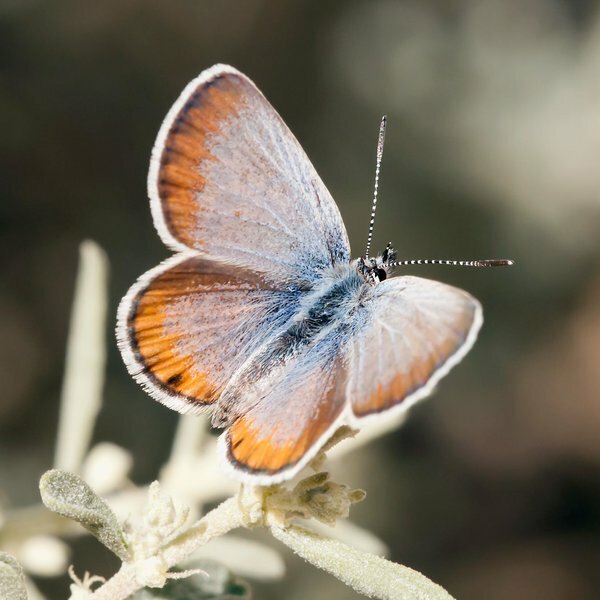 Observed butterflies moving through at the rate of 150 per min. Observed for about a half an hour. 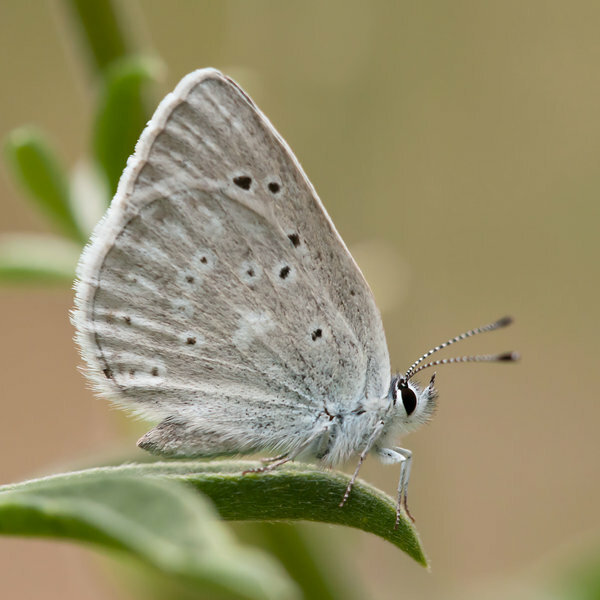 Azures were mostly fresh males of the Atlantic Holly form. 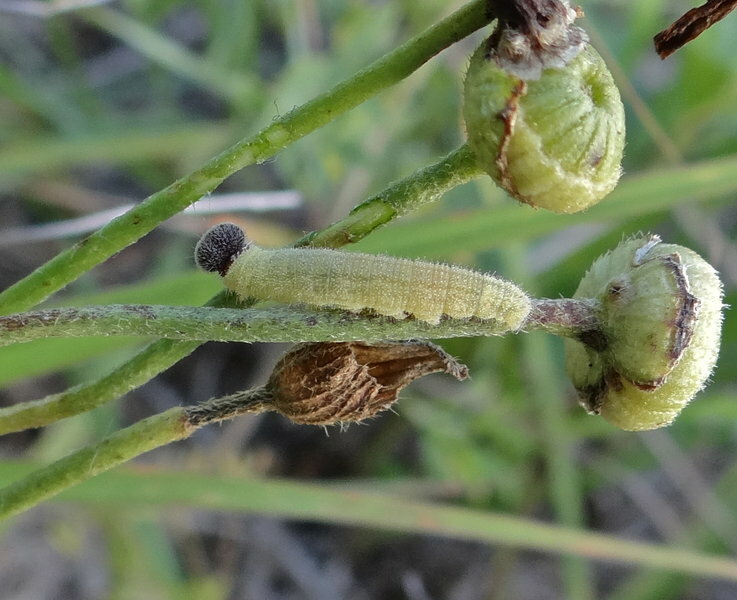 I found maybe 7 of them in total laying eggs and caterpillars all over a hackberry tree. 6-12 Red Admirals per minute moving north with an occasional Question Mark in light winds from the south. 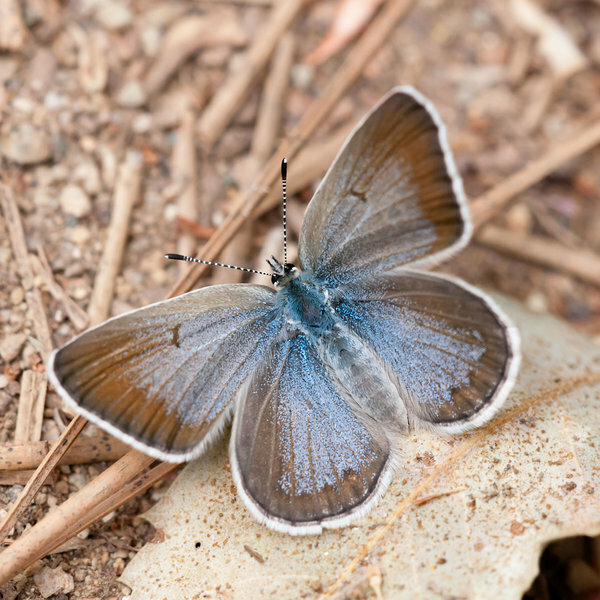 The San Emigdio Blue sighting in the Alabama Hills of California’s Eastern Sierras is a slight range extension of this species. 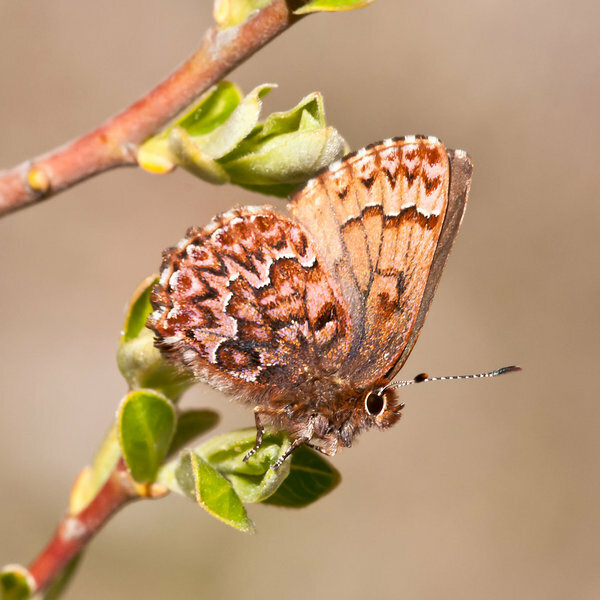 The furthest northerly sighting of this butterfly was Lubkin Canyon, which is south of this locale, according to Ken Davenport. What’s exceptional here: These Red Admirals & a Question Mark came to lights after dark (intended to draw moths) at 9 and 10 P.M. Remained at lights well passed Midnight. Red Admirals periodically spread wings. My first Monarch of the year! These counts made in very unfavorable weather conditions, and abruptly terminated by rain at 10:30 a.m.
First of the year Least and Indian Skippers. Overcast, 58—59 degrees Saturday morning for this annual field trip of the Newark Entomological Society. Still saw the Vanessas that seem to be almost everywhere this spring. Overcast, drizzling, and 57—58 degrees at midday here. 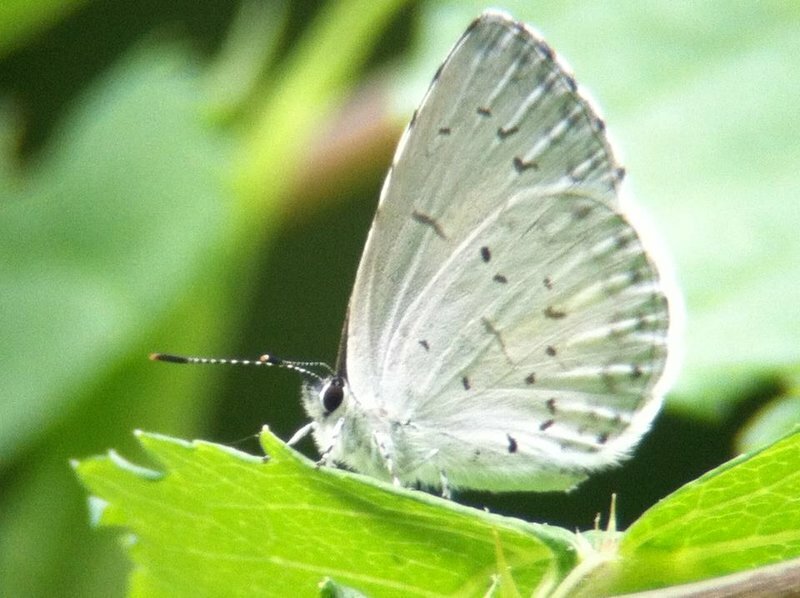 Still some butterflies here during the annual field trip of the Newark Entomological Society. However, poor weather conditions and/or the acclerated spring season may account for finding only one Hoary Elfin here in what is prime Hoary Elfin habitat. Red Admirals & perhaps a few Ladies flying north over I-95 at 7:30 A.M.
Late afternoon visit to Governor Bridge; warm and clear after a P/C warm day. In the field 1600-1730 hours. 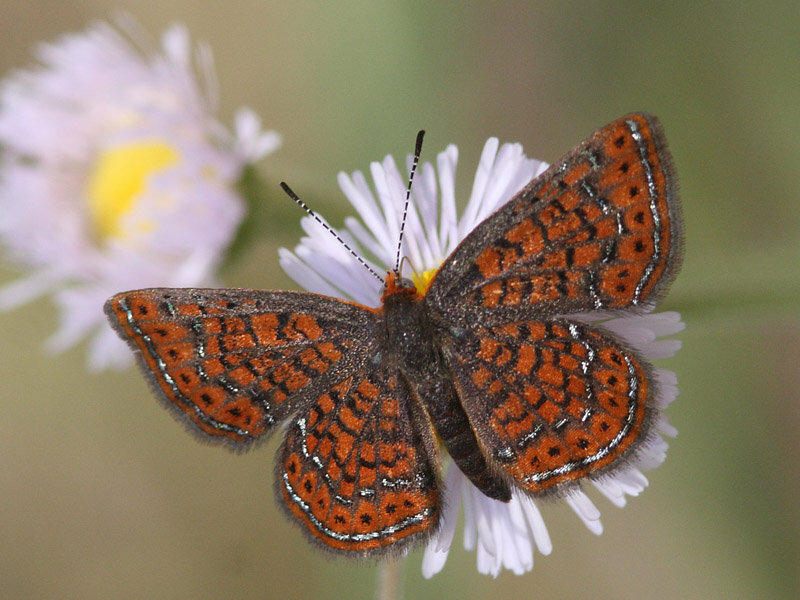 Nectar sources included clover, vetch. The migration continued when the sun came out. Saw many more on my way home including some road kills. Totals shown for 25 minutes of butterflying. 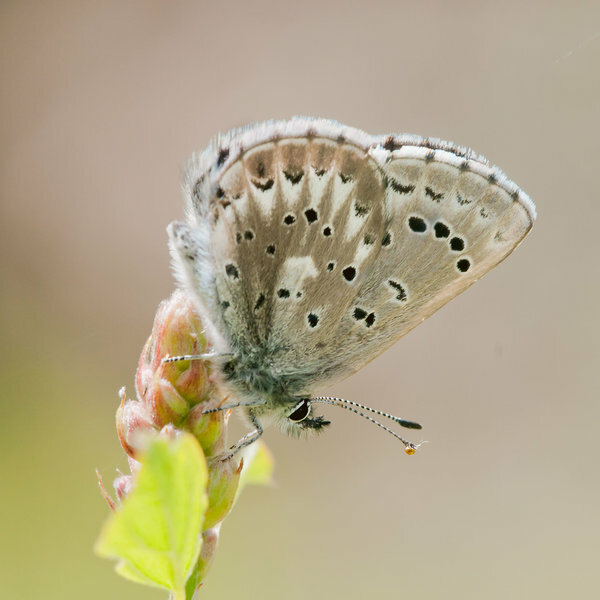 Sudden bright sun for afternoon made the difference, with a very productive set of meadows and relatively few flowers so that all the butterflies were quite busy seeking nectar, minerals, or just patrolling the area. Giant Swallowtail is my second sighting of the season in this county. 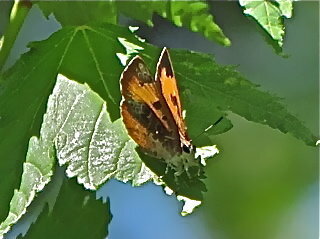 The 2 Satyr species and Monarch were my first of the year. 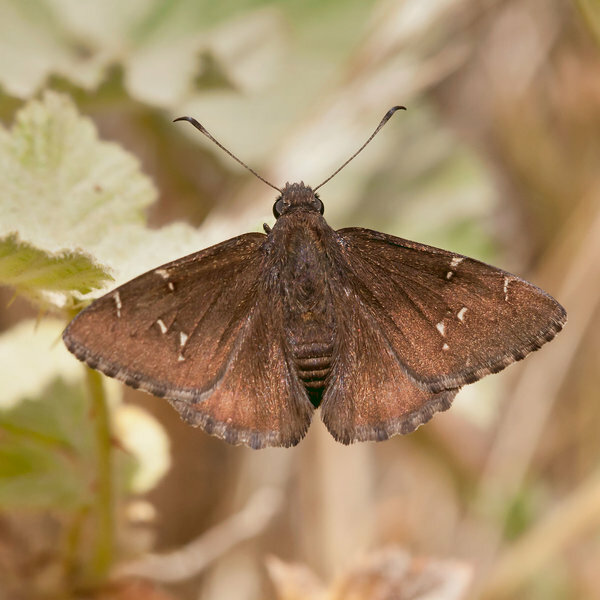 N. Cloudywing seems very early; single Indian Skipper also early! A very early spring all around. Most cloudy afternoon, warm (low 70s) with regular breeze. 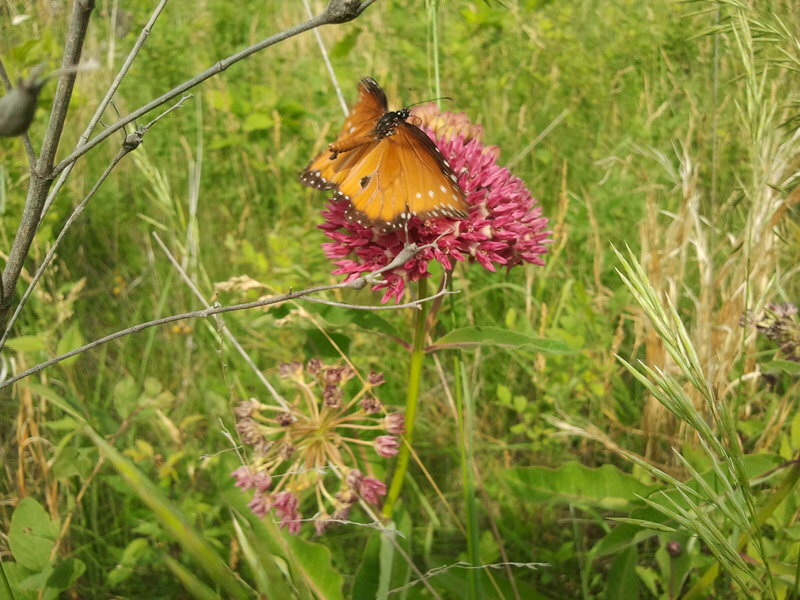 Nectar sources included clovers, lespedeza, dandelion, and blackberry. ca 2-5pm, overcast, then sunny. 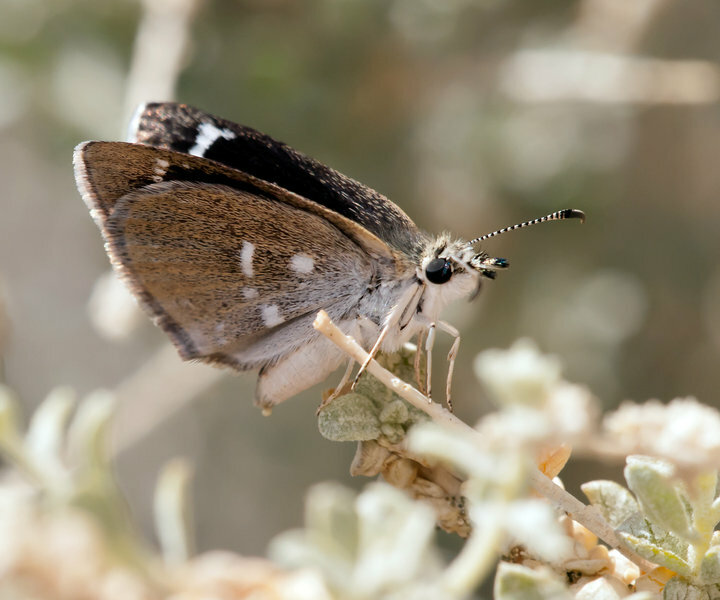 red admirals and ladies and duskywings carpeting the ground everywhere, especially anywhere with dirt/gravel/sand - on trails, and off, almost every step sent dozens scattering into the air, every autumn olive tree had dozens of butterflies nectaring. 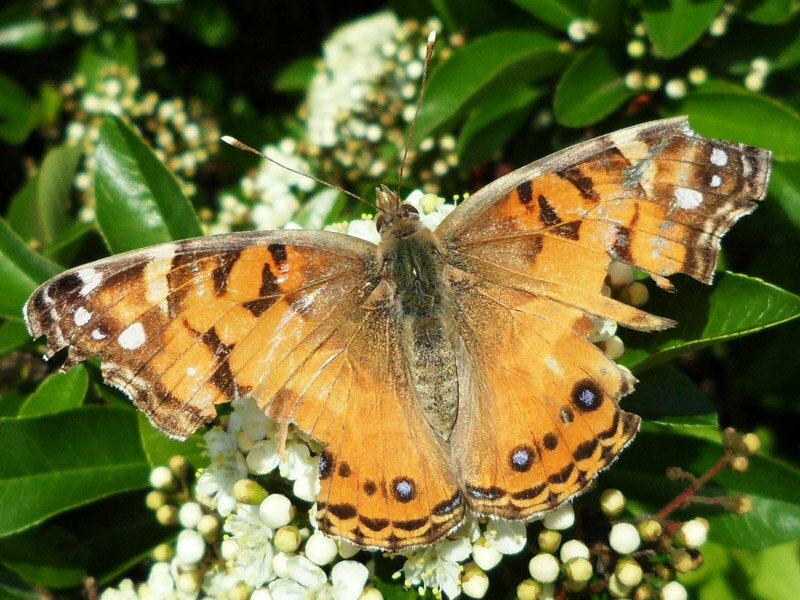 A surge of Red Admirals was encountered on the West Side Highway and at High-Line Park (The elevated Train Track converted to a walking path with extensive gardens from 34th Street to 14th Street on the West side of Manhattan) - 100s of Red Admirals in an amazing surge. Additionally - counted over (110) American Ladies - but strongly suspect another surge of American Ladies - with numbers possibly in the 100s. Too many Red Admirals to count! Total overcast, 60 degrees. Red Admirals were continuing in spite of the chill. Did 55 mile bike ride from Rockland up across N.Beacon Bridge and back down across Bear Mnt. Bridge. Saw at least 60 Red Admirals along the way. 6 Mi. SE of Eau Claire in my yard. My earliest ever sighting of this species. Again admirals and ladies were all over the place. 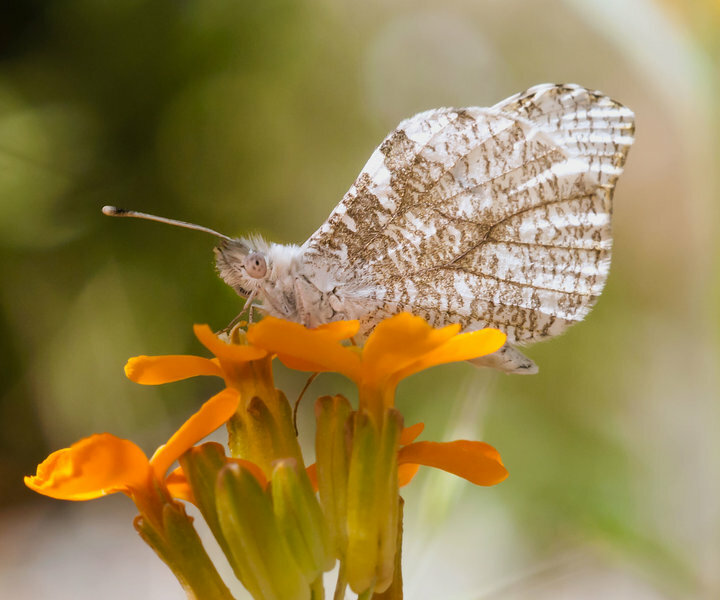 All but one of the Falcate Orangetips were found between Rt 94 and Wawayanda Mountain and this is the highest number for this species at this location to date. One hour in my favorite meadow. 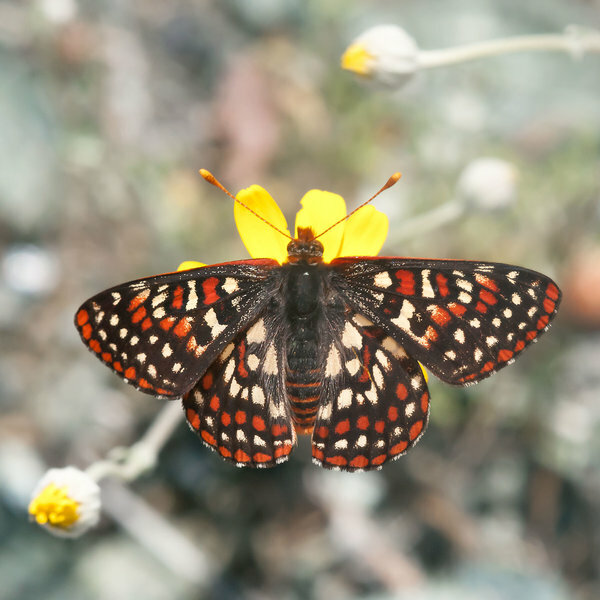 Today a huge number of Gorgone Checkerspots were flying. 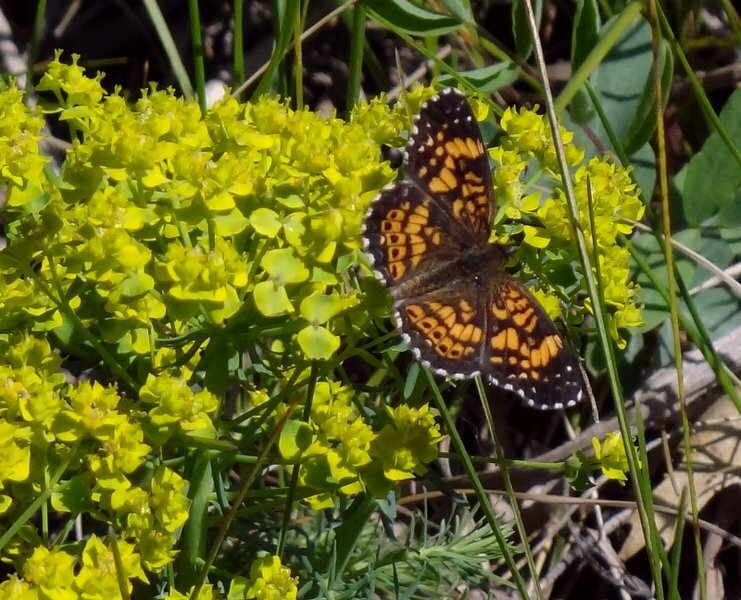 Most were either nectaring on the cypress spurge plant in the photo or “puddling” nearby. 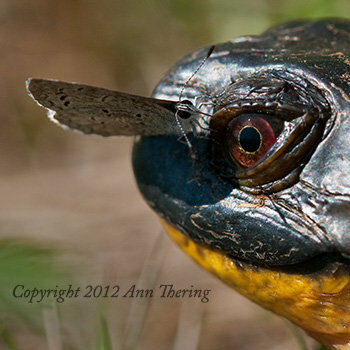 Moments later, the Blanding’s Turtle blinked in protest, and the Azure flew away. This was a Miami Blue NABA Chapter Field Trip. 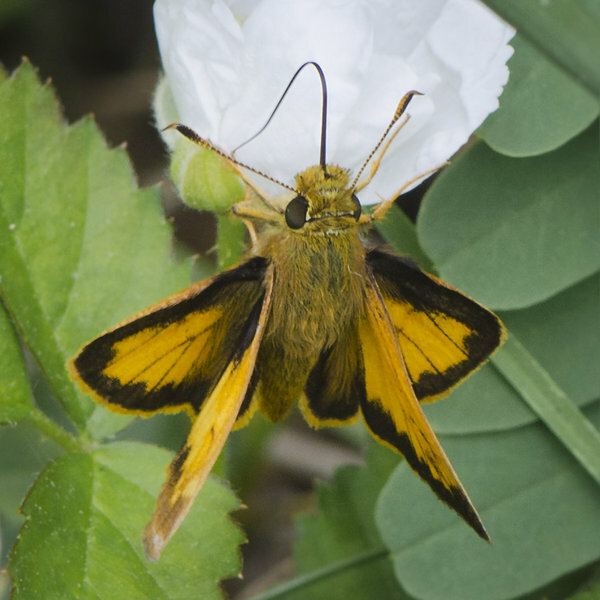 6 Pink-spot Sulphurs were seen at Coral Reed and many were seen at Modello Park. Ash Creek Road is 4.1 miles west of Interstate 5 on Hwy 96. 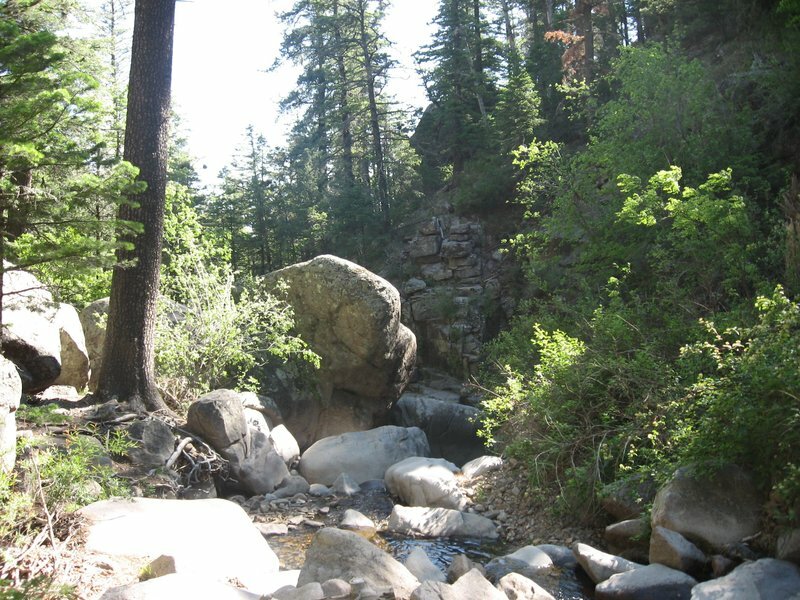 Ray Bruun and I drove up to Ash Creek Road, which is a well-known locale for California Crescent. Then we drove west to Beaver Creek Road and drove north into the Klammath Mountains. 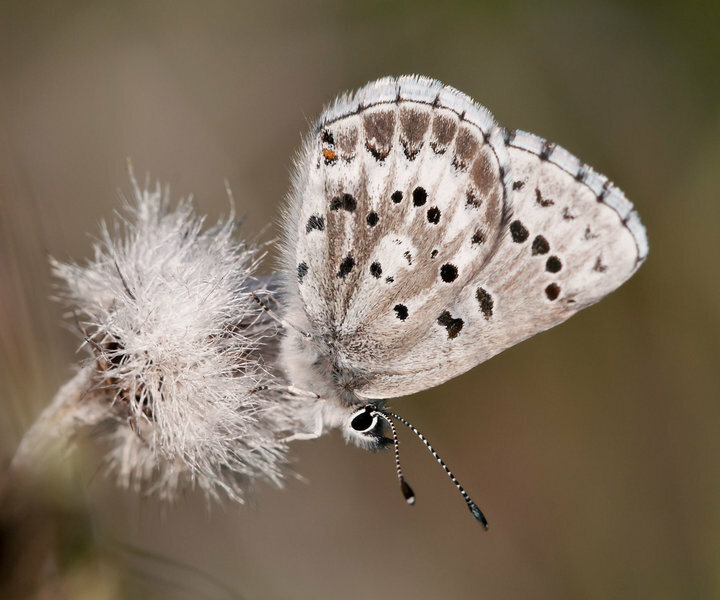 We finished up by stopping in Greenhorn Park in Yreka, to photograph the Arrowhead Blues that reside on the face of the dam. 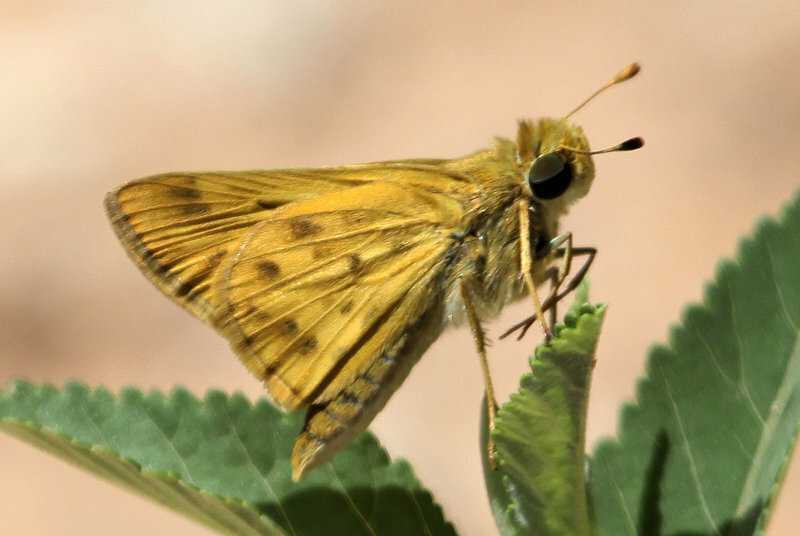 I didn’t take notes on species counts this trip, but I did remember the counts for the target species of California Crescent and Columbian Skipper. 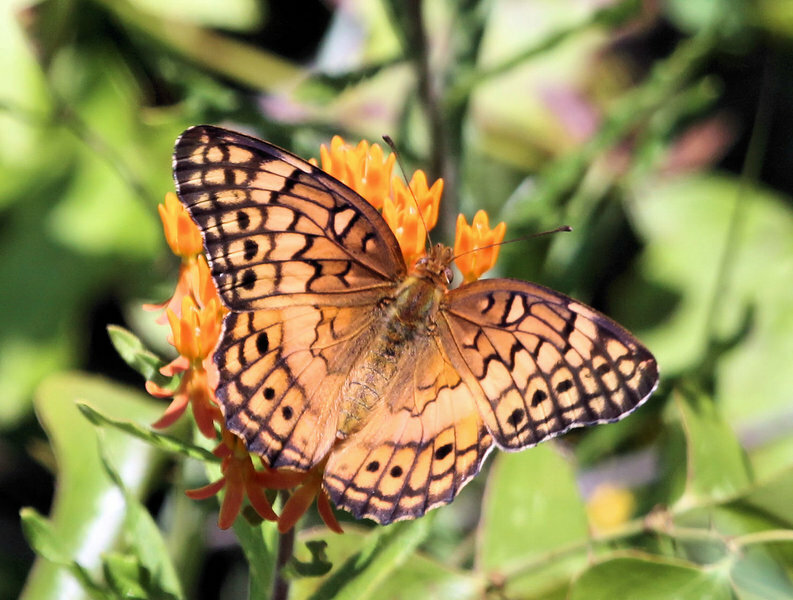 Very deep orange colored sleepy orange stopped at a few yellow weed flowers in my yard then flew off in northwest direction. Red Admirals streaming through 30 - 50 hourly throughout the day. These sightings were over a three day period, May 11-13. Hoadley Peaks Road, north of Buckhorn Summit on State Highway 299. This is right before you get to the county line with Trinity County, and roughly 30 miles west of Redding. 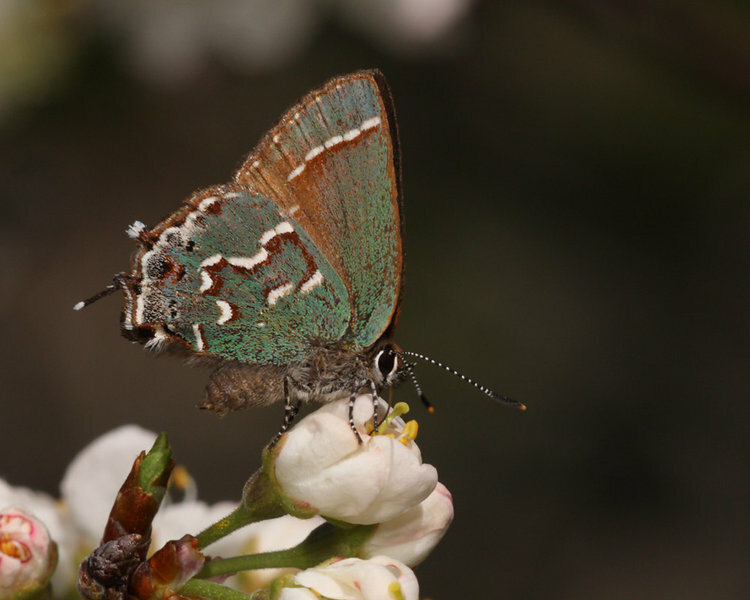 I took a short drive up to the Buckhorn Summit area to photograph the Bramble Hairstreaks that Ray Bruun found. Came here to see if Bronze Coppers might have emerged early; no luck. In fact, butterfly numbers seemed a little down. Monarch FOS, Female apparently scouting for milkweed. First Monarch for 2012 - Red Admirals surging throughout day - in the 1,000s. 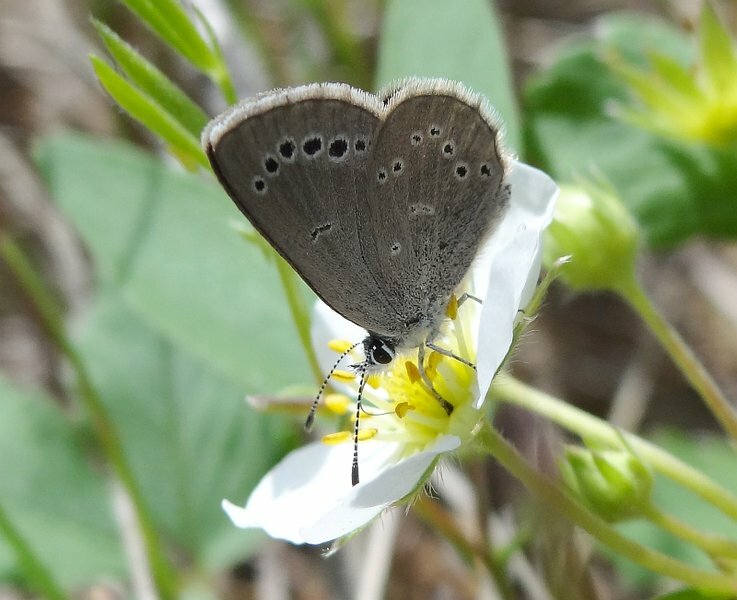 Ringlet is still an unusual species on Long Island. 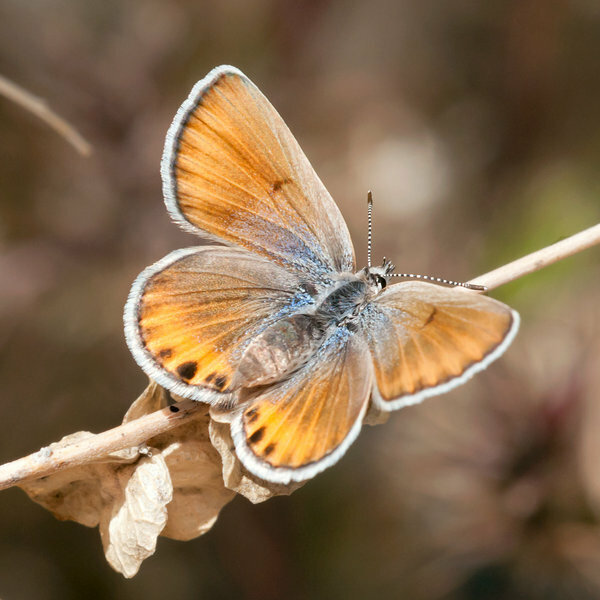 First of the year: Viceroy, Little Wood-Satyr, Northern Cloudywing. 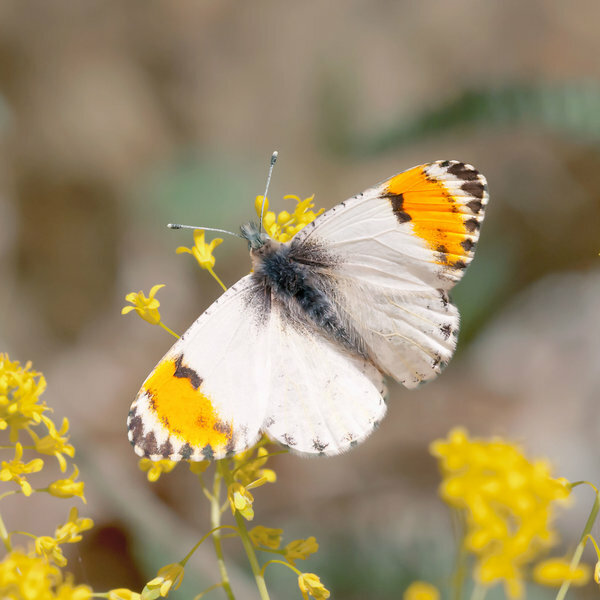 Orangetip was a female. Last stop with colleagues Beth Johnson and Tom Stock on a Washington Area Butterfly Club full-day field outing. This leg covers Hoyle’s Mill from the parking area to the bridge and back. In the field from 1530-1630 under warm, slightly overcast skies. 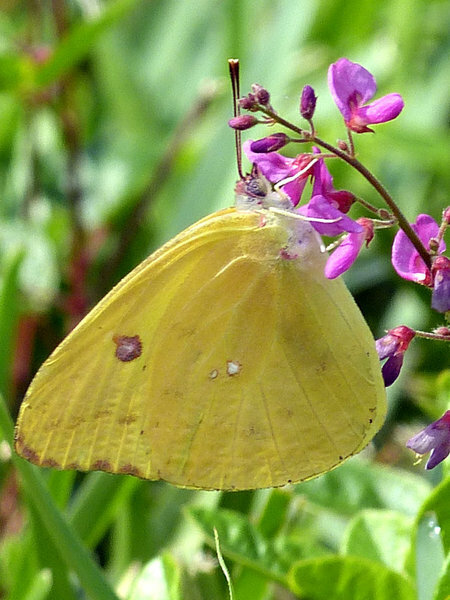 Nectar sources included emerging dogbane, fleabanes, and heal-all. Second stop with colleagues Beth Johnson and Tom Stock on a Washington Area Butterfly Club full-day field outing. This leg covers Lilypons water gardens for about 90 minutes from 1330-1500 hours. Sunny and warm becoming slightly overcast; temperature in upper 70s. Nectar included fleabanes and blackberry, predominantly. First stop with colleagues Beth Johnson and Tom Stock on a Washington Area Butterfly Club full-day field outing. This leg covers the High Knob Overlook and along Gambrill Park Road in Gambrill State Park and the adjacent Frederick Municipal Watershed forest. While temperatures had been in the 40s overnight, by the time we were in the field at 10 am we were in the 60s and would climb to 70s by the time we left at around noon. Light breeze, full sun. Nectar included fleabanes and blackberry, predominantly. 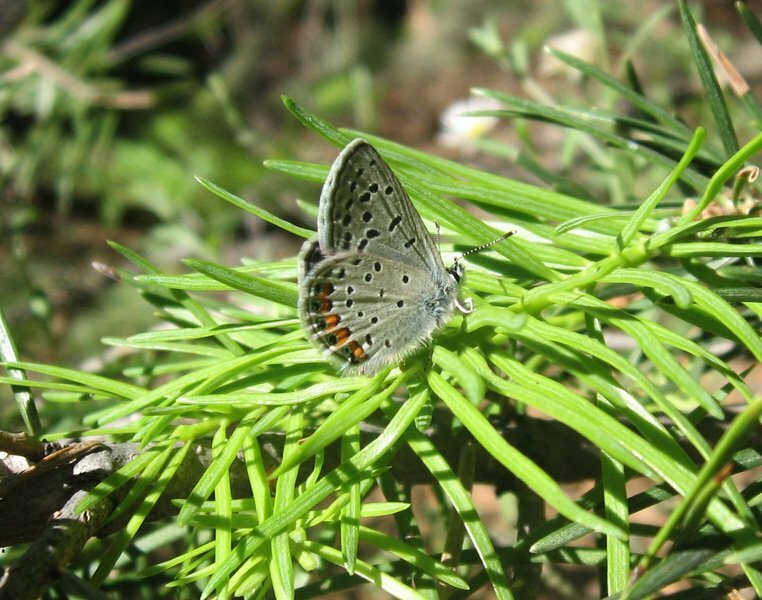 Possible early sighting of the Appalachian Azure. Eastern Tiger Swallowtails seen only at the lowest elevation and near a larger river. Canadian Tiger Swallowtails all looked very fresh, many puddling at elevations over 2,500 ft. Variegated Fritillary along road, uncommon and unexpected here. 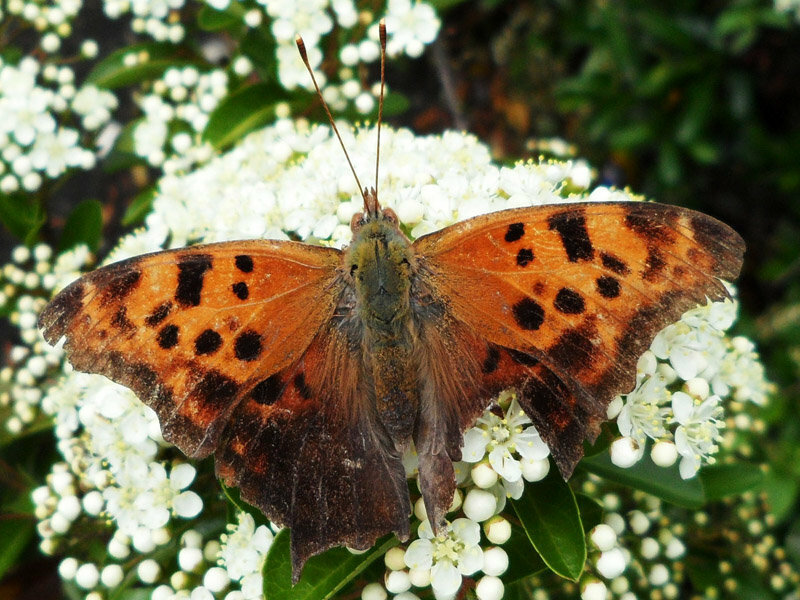 Milbert’s Tortoiseshells worn, & seen above 3,900 ft. elev. 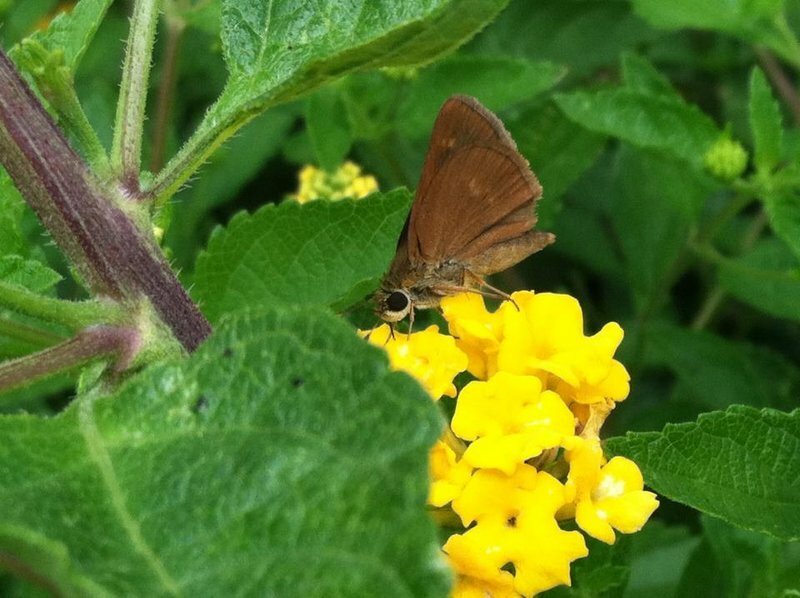 Skipper sightings early for this area. The majority of all species found were in the town of Phoenicia. Good movement of Red Admirals seen, as they have been for weeks throughout the entire region! Dansville SGA - Seven Gables Rd. 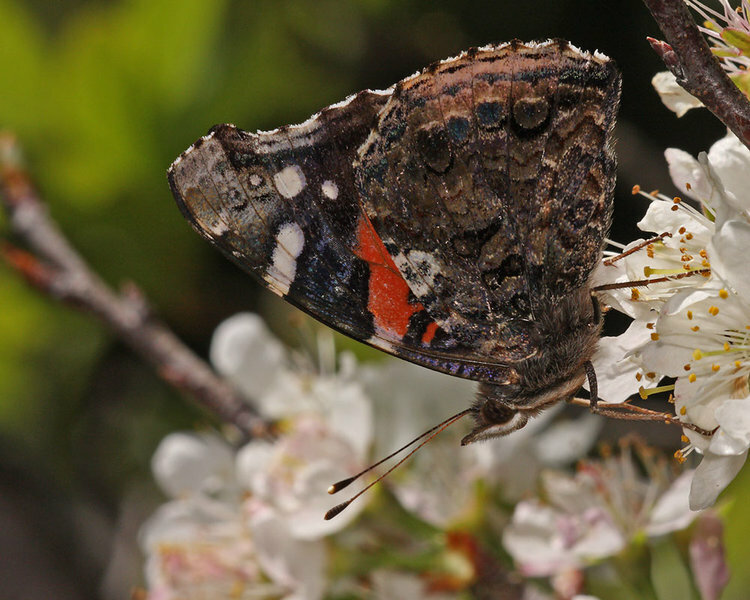 various sites, mostly at elevation of about 2,000 ft.
Red Admiral migration has dwindled dramatically. Warm, sunny day at my favorite Oakland Hills location. Buckeye trees were not yet blooming, so the peak of the season is still to come. 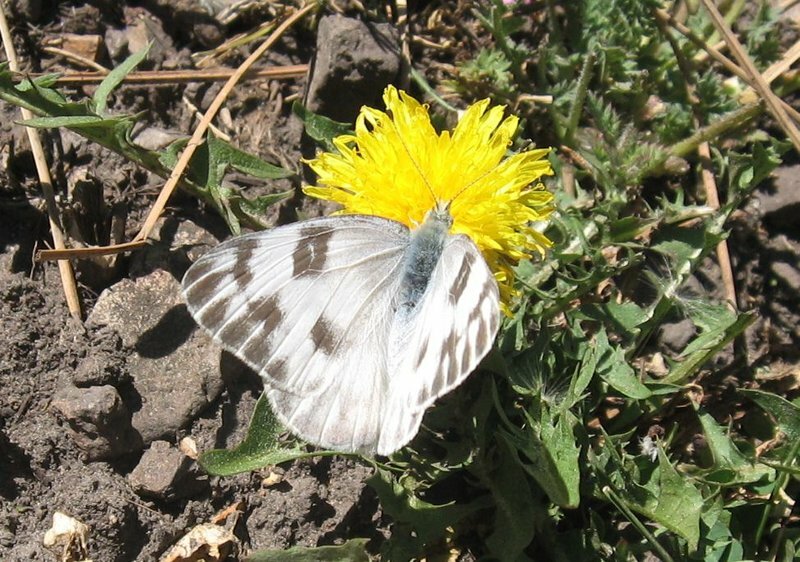 Had high counts of Pale Swallowtail and Lorquin’s Admiral, but lycaenids were at the lowest levels I have ever seen in Redwood Park. The day was sunny with a slight breeze (<5 mph) and 75° F. I was checking out the bog area along the RR tracks for the first time and looking to see what was there. 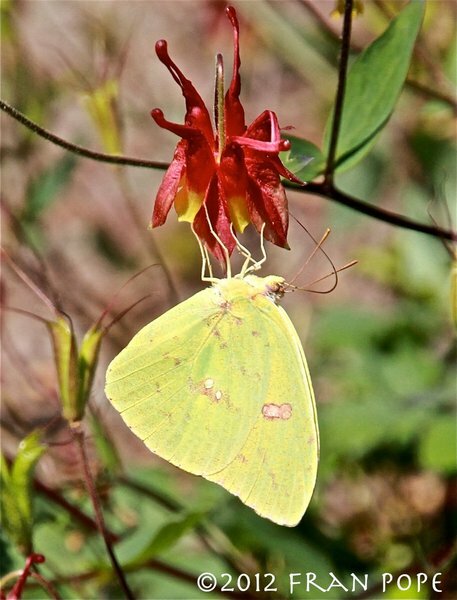 I ended up getting lost and going in a big circle back to where I started when I spotted a large, yellow butterfly I had never seen before. I discussed it with Jim Springer, sending one poor-quality photo and we determined it was a Cloudless Sulfur. This was my first sighting of this species. 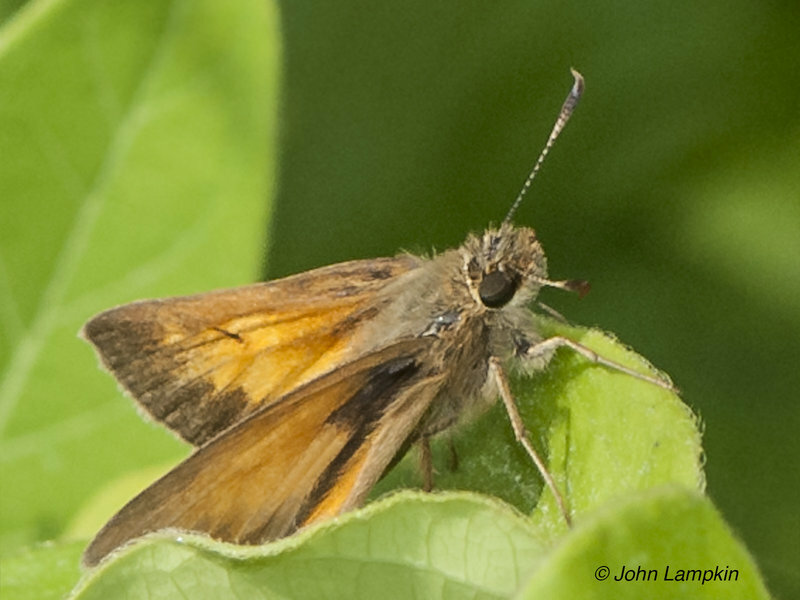 FOS Cobweb Skipper for this site. 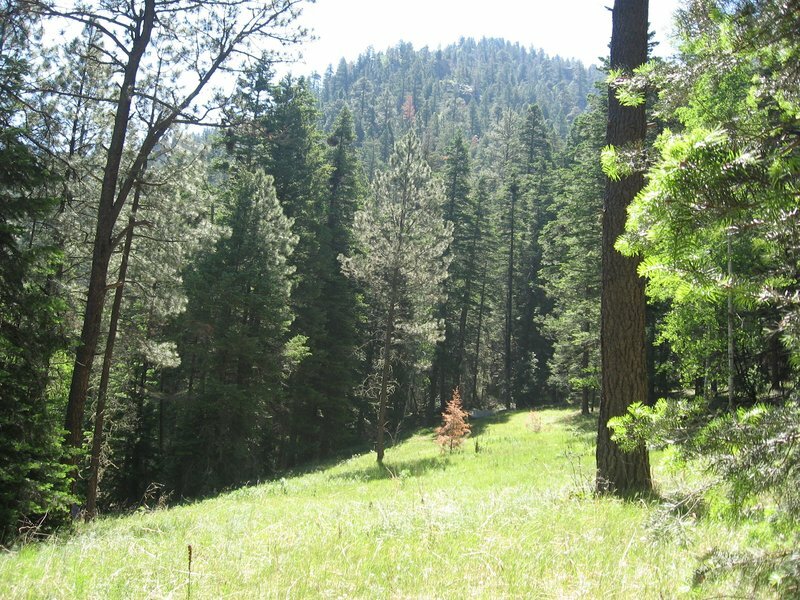 Although abundant atop Kakiat Mt., few make it down to lower elevations. 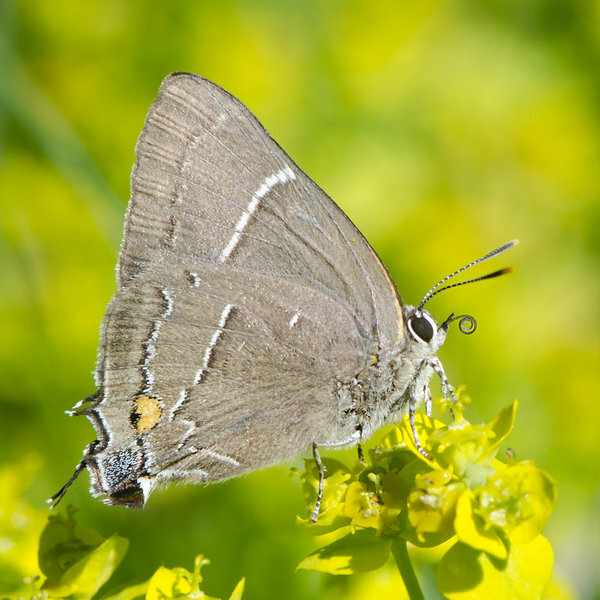 We had found a worn White M Hairstreak in this same location on April 20. Hopefully this will become a reliable location for this uncommon Rockland species. 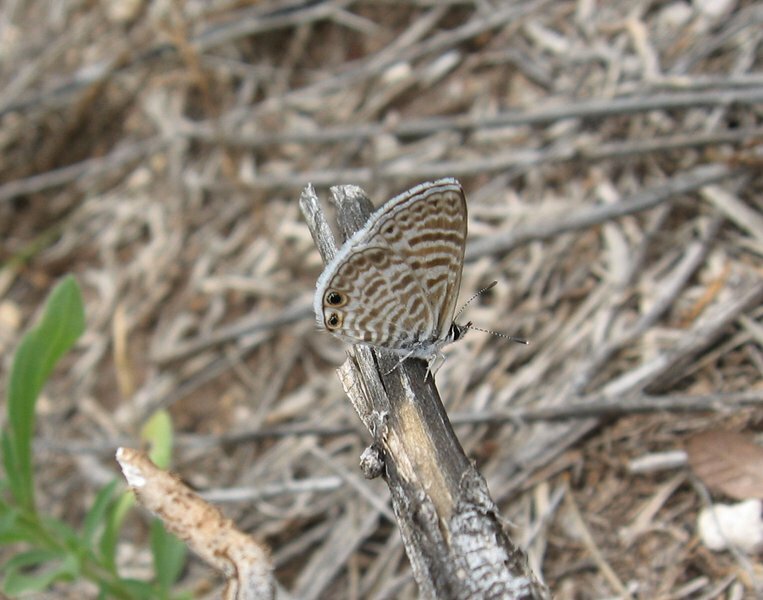 The second pic shows a glimpse of the brilliant blue above, revealed for only a second as it sawed its wings. Plenty of time and great weather. Surprisingly few butterflies. 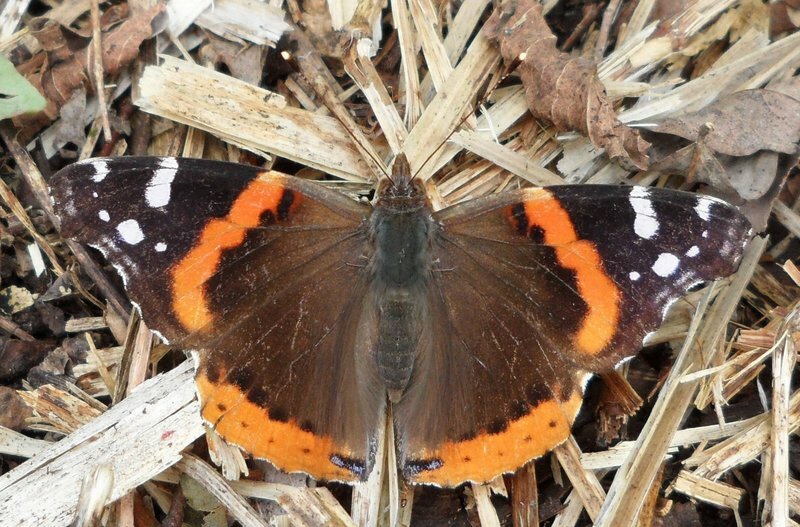 The epic Red Admiral movement appears to be over. Pepper and Salt Skippers were the first ones of the year. 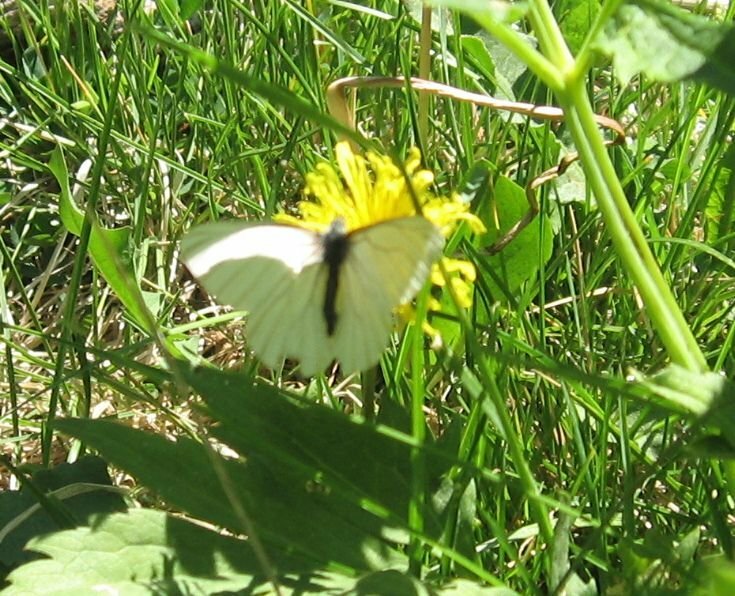 Also observed two unknown white butterflies, probably West Virginia Whites. This is only the second year a Funereal Duksywing has ever been recorded from Iowa. private property, central Litchfield Co.
photo by K. Wallstrom; seen in an area that has produced this species in other years, near a swampy area with Alder growing. Land is private; entry by public right-of-way. Long Dash is uncommon in the park. Surprised by the scarcity of Eastern Tiger Swallowtails here right now. 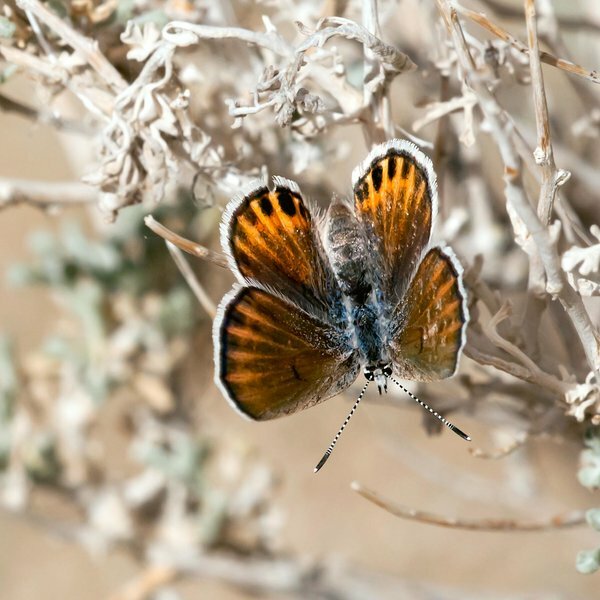 Glad to see all the spring Skipper specialties of these serpentine barrens! 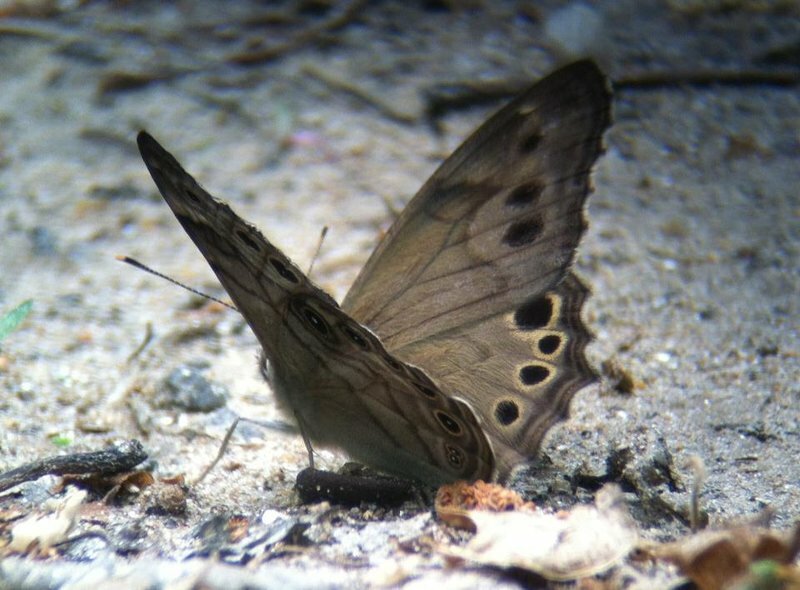 First Red-Spotted Purple in this location for 2012. Old Mine Rd., West Pt. M.R. 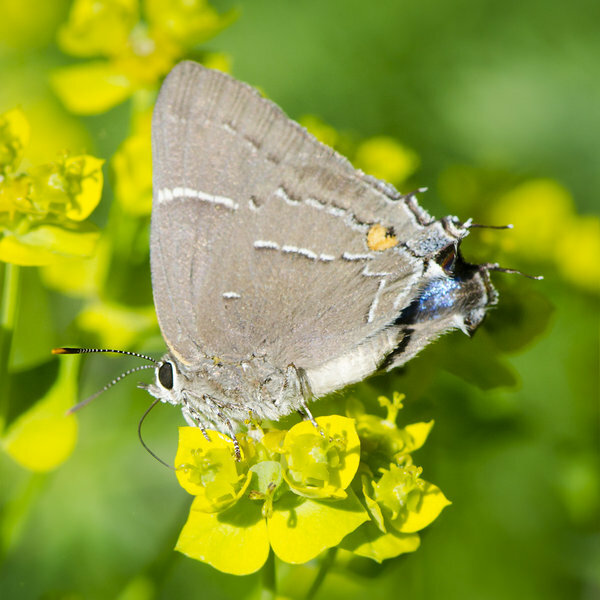 I can remember when Red-banded Hairstreak was a “state rare” organism in New York State. Now they are hard to miss downstate. Red-spotted Admiral had white stripes. Doodletown Rd., Bear Mt. S.P. We were kayaking on the lake and the butterfly landed on one of our guide’s kayaks. Stayed for about 5 - 10 mins. Could not get pic. Queen on the Byron Shutz nature trail through the native remnant prairies, nectaring on Purple Milkweed (Asclepias purpurascens). Bauer Brockway Barrens and other spots within the Wazee NABA count circle. Location: Bauer Brockway Barrens and other spots within the Wazee NABA count circle. This was SWBA’s 6th annual combination field trip to Bauer Brockway Barrens and Wazee NABA spring count. 18 participants using close-focusing binoculars. 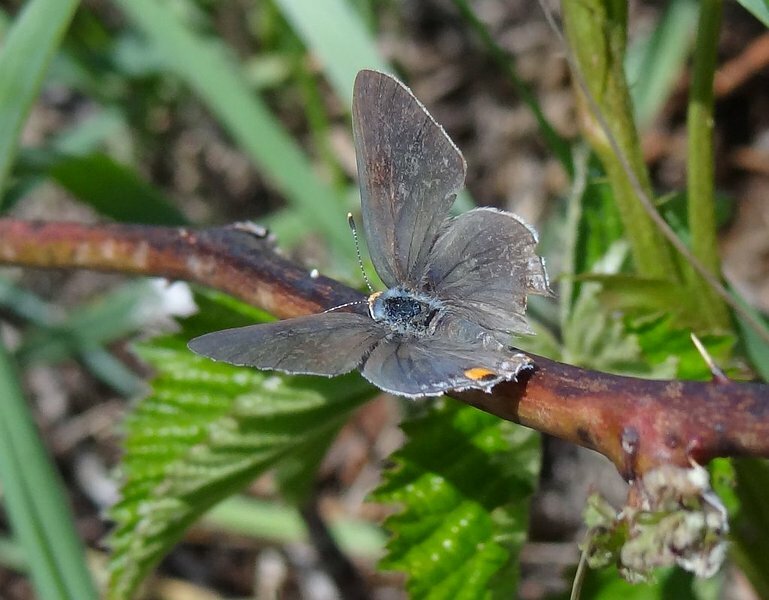 With vegetation and flight periods well advanced, we observed a somewhat different set of species (fewer early spring species, more early summer species) and southern immigrants (Gray Hairstreak, Common Buckeye, Red Admiral, American Lady, Painted Lady, Common Checkered-Skipper, Orange Sulphur). Previous highest count (in ordinary weather) was 26 species. 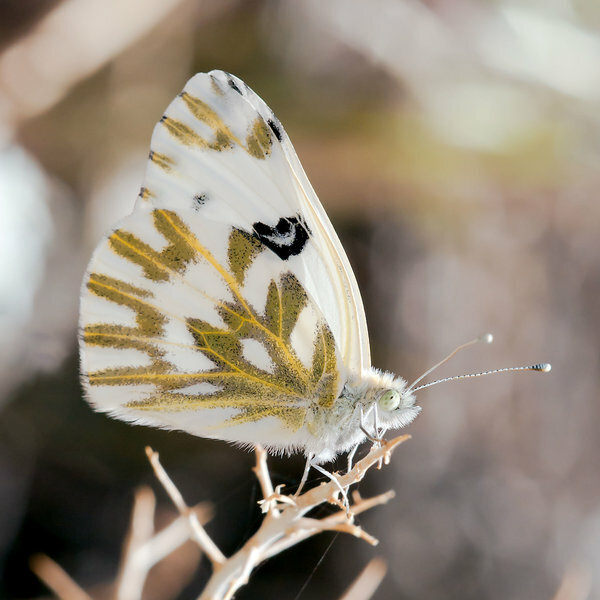 This year (extraordinary weather) produced 42 species. Some participants came from as far away as Minnesota, Illinois and Massachusetts. High temperature of 91! I spent the afternoon mostly close to the McDonald parking lot, where most of the butterflies were concentrated. Norton Shores leaf dump on Wood Rd. Hiked for 3 hours, sunny, temp 70, wind NNW 10-15. 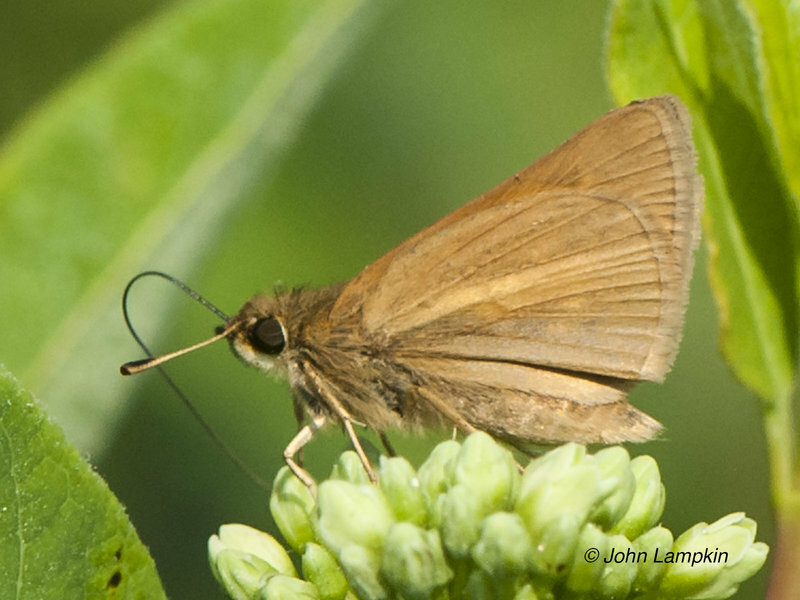 Looking for the Arctic Skipper, rare for Muskegon County. Forest Service Road M4 is a main road through the Mendocino National Forest and starts a few miles west of the town of Paskenta which is in western Tehama County. Washington Area Butterfly Club field trip in partnership with Maryland Native Plant Society. In the field 1000-1600 hours along Wolf Trail, Heron Loop, and Fox Den Loop. Mostly sunny with high overcast, temperatures in mid-70s. Few nectar sources: blackberry, dewberry, white clover. 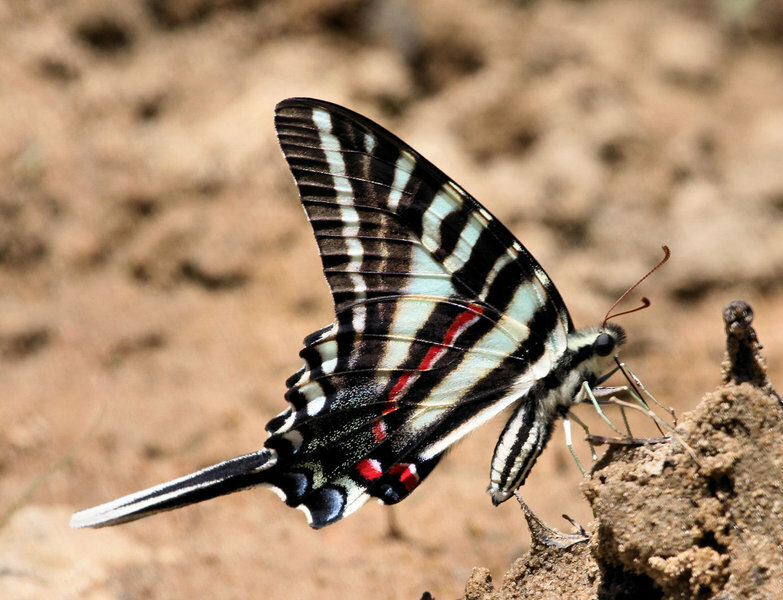 Two of the Zebra Swallowtails appeared to be fresh ” longer tailed ” 2nd brood individuals. The Falcate Orangetips were all fresh and two were females. 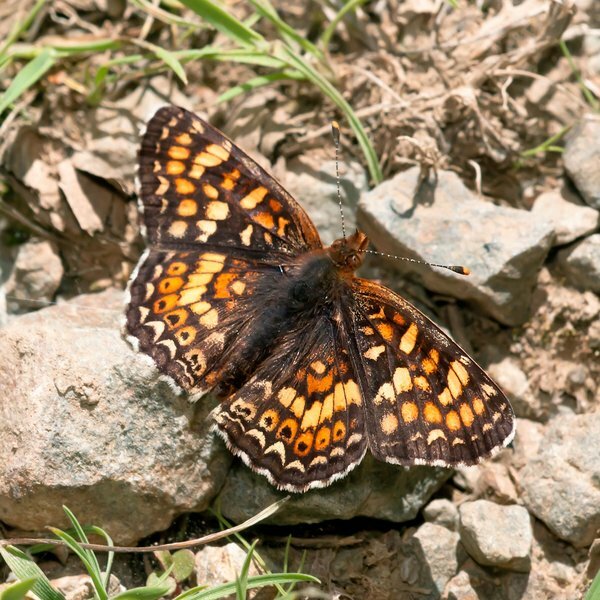 30 species, quite good for so early in this county, a borough of N.Y. City… Red-banded HS was very fresh and vividly-marked; a good spring so far for Variegated Fritillary in the region; rather early for Sachem- once a true rarity in NY, now regular near the coast; early for Dun Skipper, but an early spring continues along. 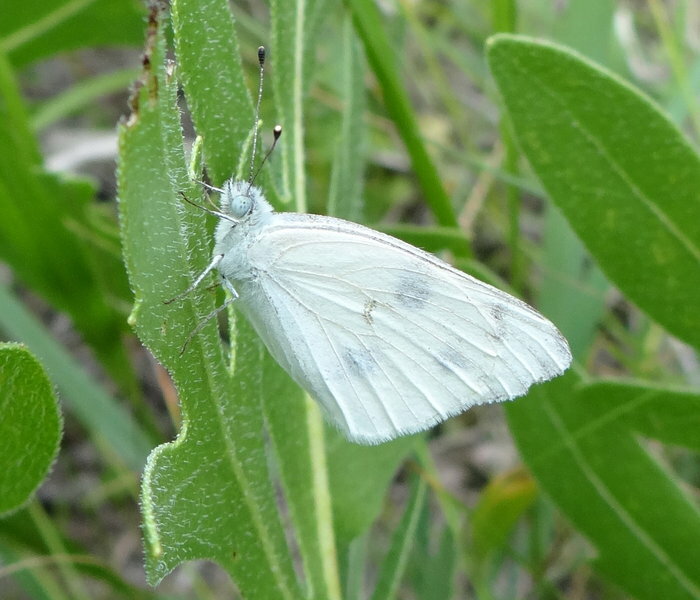 My personal first-of-year Summer-type Azure; also good to see a number of Monarchs, some of which investigating a planted non-native milkweed. Warm-humid day, starting a holiday weekend. 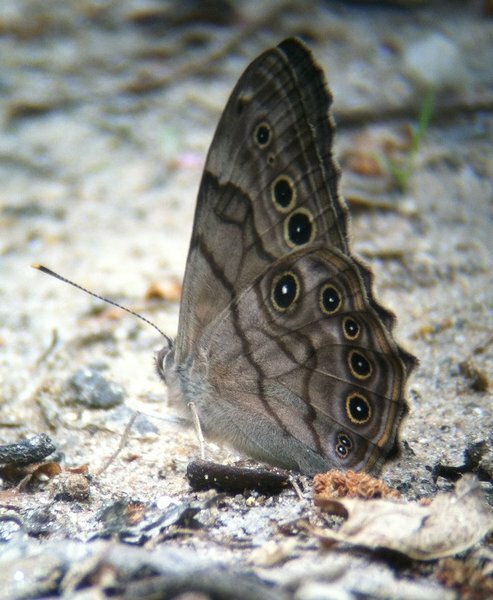 The Mourning Cloak was very fresh and all the Swallowtails were attending a puddle party. Most of time in south end of bog. Late PM walk in north end. Mustard Whites in parking area at south end. Photo taken by Lew Rosenberg. 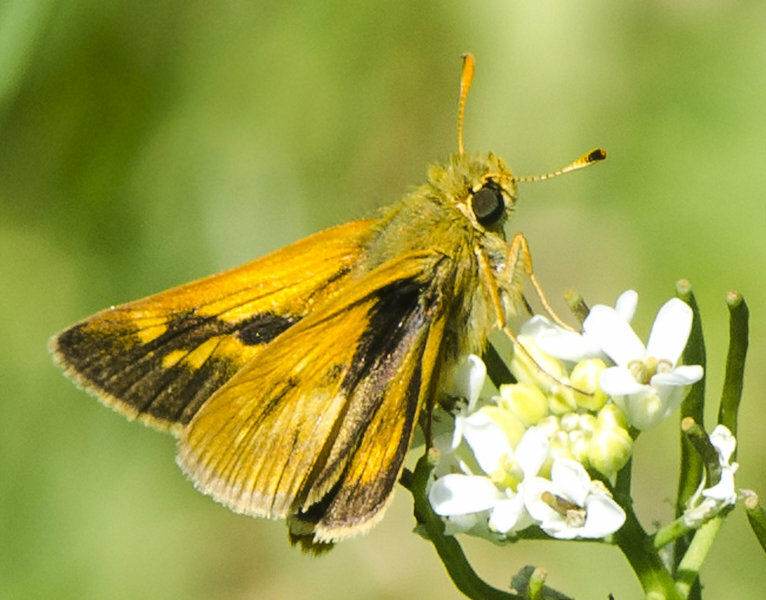 The farthest north the Fiery Skipper has been seen in eastern Wisconsin. 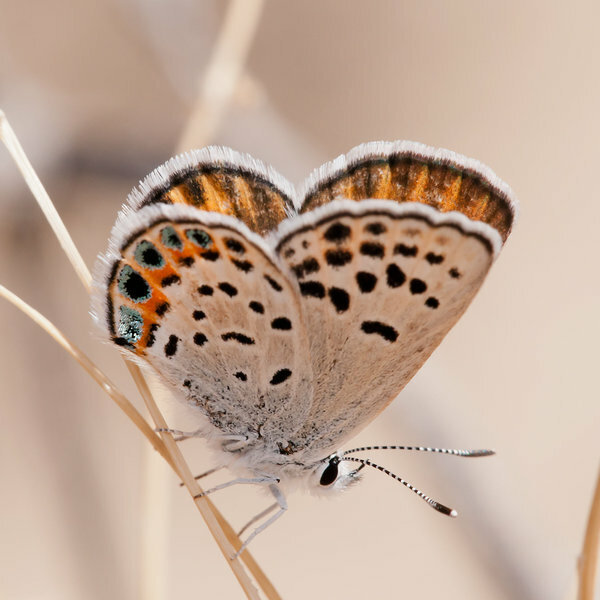 I photographed butterflies along the El Dorado Mine Trail. Then I drove a short distance to the town of French Gulch and worked the roadside ditches along French Gulch Road. Doug McWhirter and myself surveyed the Dansville SGA count circle. An excellent day with 29 species seen. My personal first-of-the-year in NY state. 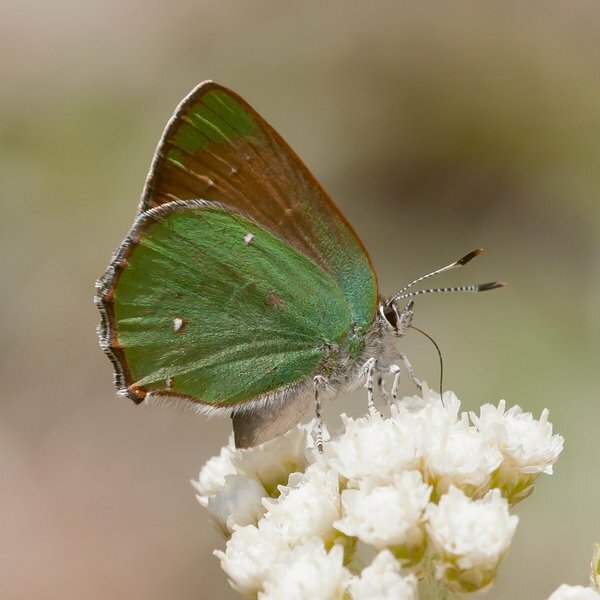 Gray Hairstreak perched on wall - wings vertical - alongside various moths, including Emeralds — 9 a.m. 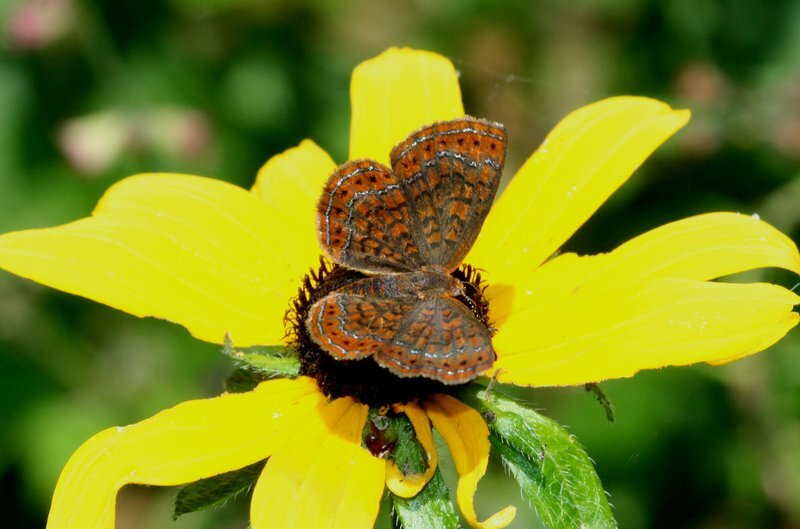 This population of Swamp Metalmark was discovered here last year. There were at least a dozen. 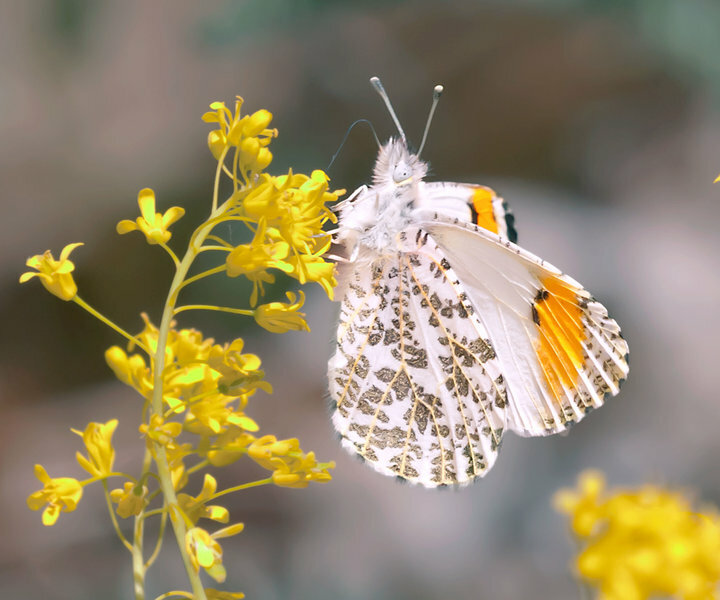 The Mustard White was seen on a road off of Pleasant Mtn. Rd. in Franklin Co. up in the mtns. 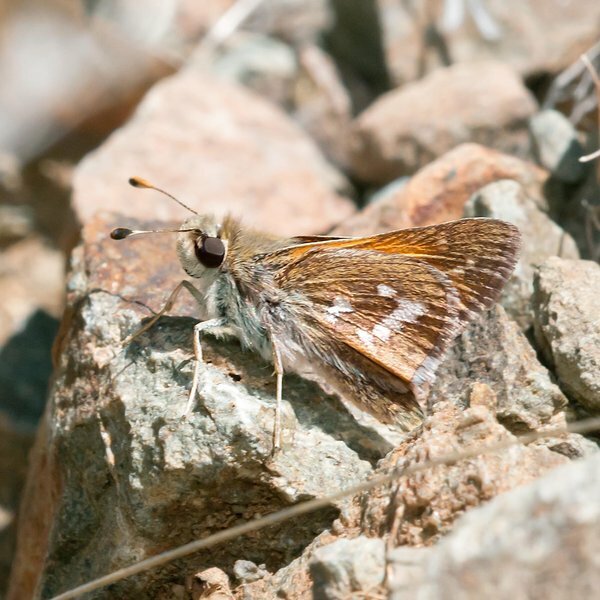 The Arctic Skipper was near the Tumbledown Mtn. trailhead off the Byron Rd. 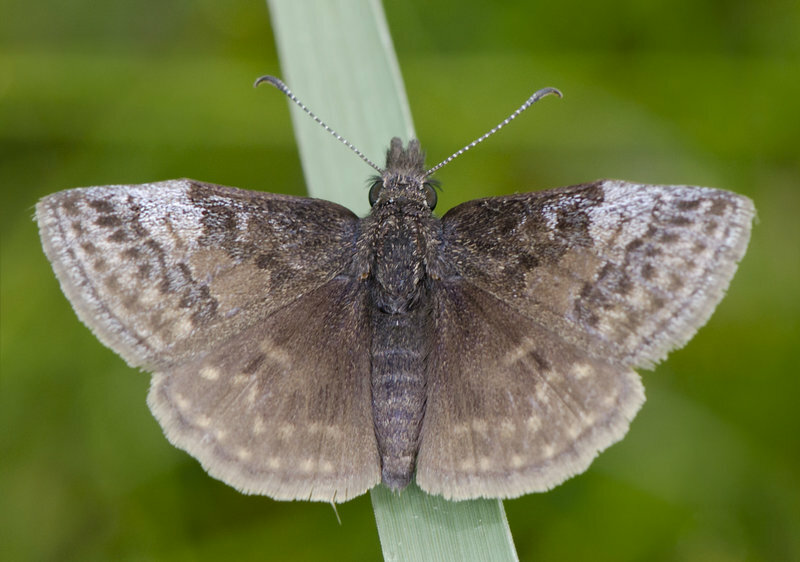 Dreamy Duskywings are rare at this location and this one was fresh. Tawny-edged Skippers are rare here too and these two were a mating pair.The Giant Swallowtails were all worn and the Great Spangled Fritillaries are early. 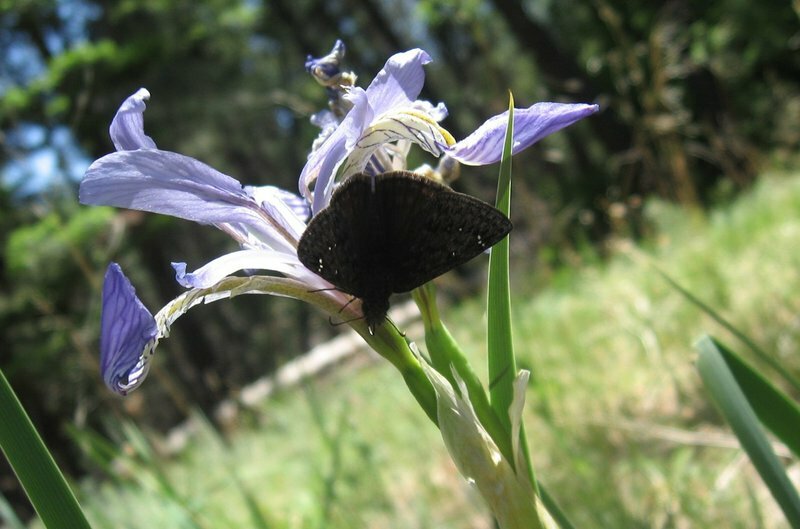 The Red-spotted Admiral was road killed. The day was sunny and hot, in the mid-80’s with a slight breeze. There were a lot of butterflies out and about. 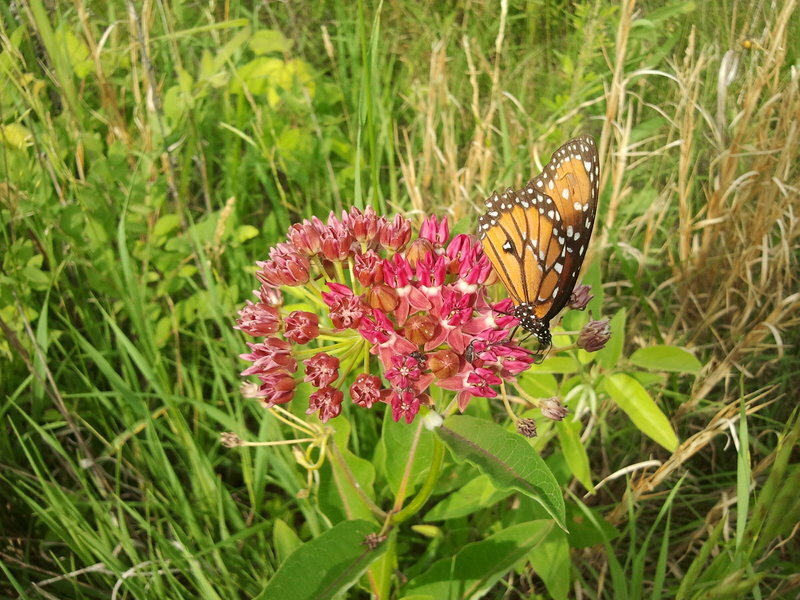 The milkweed and dogbane were both budding but not blooming, so there were not many nectar sources available. 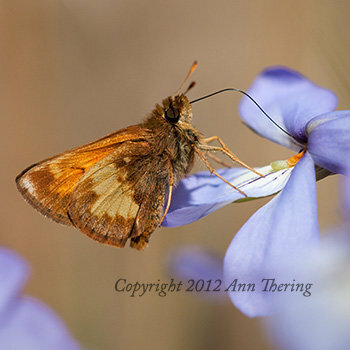 European Skipper population will likely increase as this site has periodic irruptions. 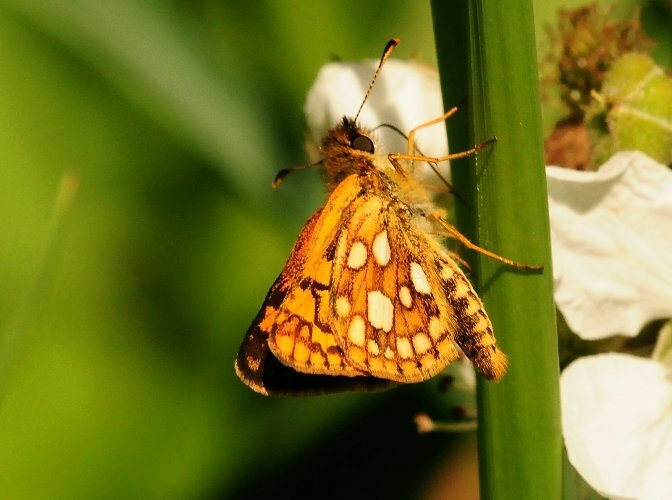 Silvery Checkerspot is VERY rare in May in NY state,most often June or early July in past years. 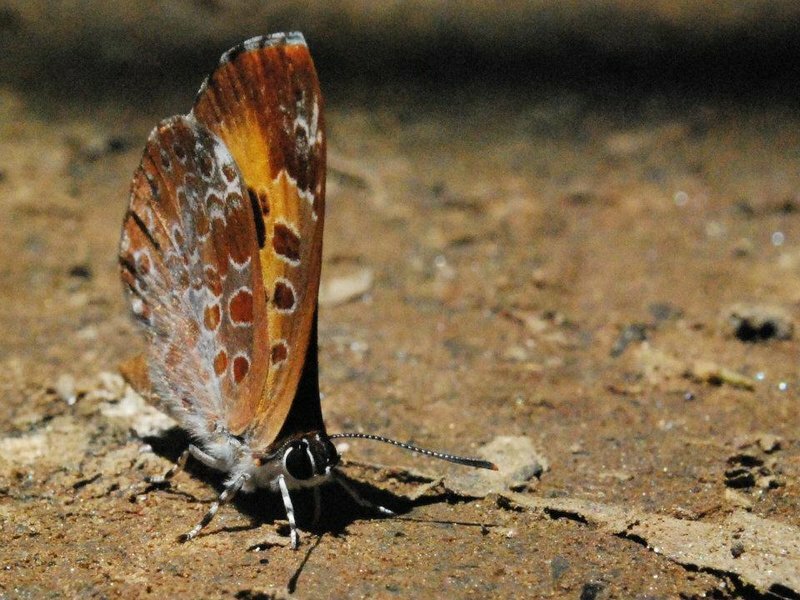 The individual male seen was very newly-emerged and found mineralizing and perching in a wooded glade along a quiet trail. Satyrium haistreaks looked for, but not seen yet. 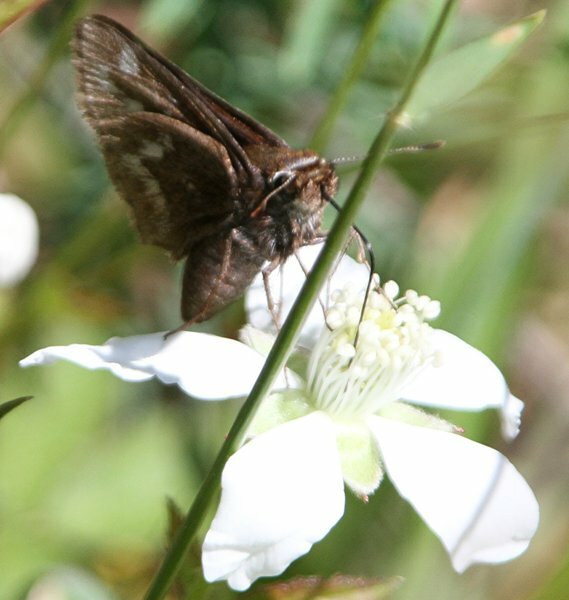 The Common Checkered-Skipper is on Purple Poppy Mallow. 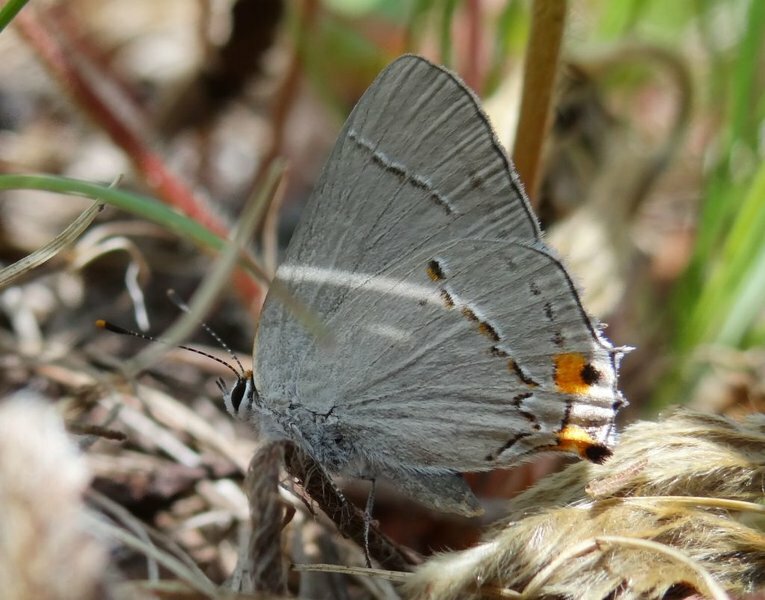 This is the farthest north that the Gray Hairstreak has been found in Wisconsin.